As we’ve mentioned in our previous blog, every business needs security. When deciding to implement a security team, though, most business owners are confronted with a choice when determining the best route for keeping their company safe — hiring their own security staff or contracting a private security company. As many companies in San Antonio will tell you that have worked with Reveles Intelligence, in most cases, hiring a private security company gives your company an edge over forming an internal security team due to the myriad of benefits that they have to offer. The following are just a few of the most common benefits that hiring a private security service for your small business or corporation can offer you. If you own a business in the San Antonio area and want to ensure your company’s assets and employees are kept secure, contact Reveles Intelligence group today for a free consultation with our Department of Private Security. Professional security guards are better trained and more knowledgeable than any in-house staff when it comes to security. They have the know-how to handle any security concerns that could potentially occur at your premises because they’ve seen it all. With an internal security team, you will be held solely responsible for every action they perform. This means that whatever your employees do or fail to do falls on you and your company’s insurance, which can be dangerous — especially with a team that is not properly trained in the manner that private security guards are. When you hire an external private security service, such as Reveles Intelligence Group in San Antonio, your guards covered by their company’s liability insurance rather than your own. This puts a lot less stress on you as a business owner. Any company executive, especially an HR representative, will tell you that hiring an internal security staff is a grueling, time-consuming process. First of all, you need to advertise for the security positions, then you must interview and perform background checks on applicants. After hiring some applicants, you have to spend time and money on training them to properly keep your company secure. Luckily, this is far from the case when hiring a professional security service — all you have to do is make a phone call. The private security company then takes care of the onboarding process and provides you with a professional security staff that is ready, willing, and able to get the job done. Have you ever had someone call in sick the day of? Or maybe had to quickly replace an employee who resigned? Most business owners will answer yes to these questions with an unhappy look on their face, as they’d rather avoid these hassles at any cost — especially with security staff. 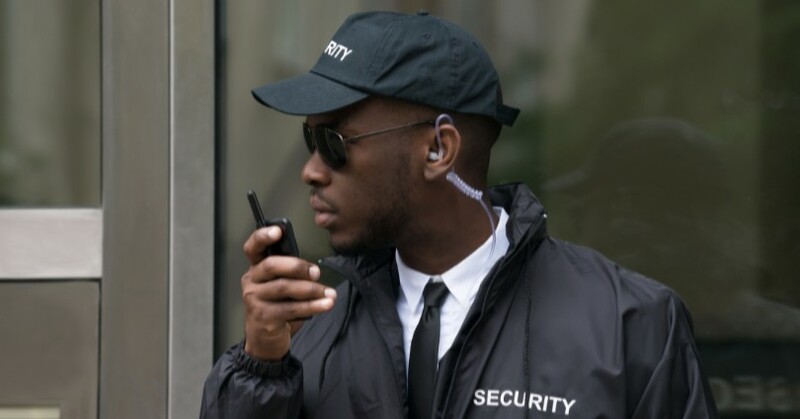 When you hire Reveles or another private security service, the security company will take on these responsibilities and ensure that your site remains fully staffed with nothing but the most qualified personnel for the job. With a professional security company, you can customize your requirements according to your business’s needs—which may not be possible with your proprietary staff. As the client, you can require the security company to make personnel and schedule changes as you need them. No need to be concerned about HR implications or labor law limitations. Simply ask and the security company is responsible for getting it done. You have total flexibility. It’s safe to assume that if you’re running a business, you likely don’t have an extensive knowledge or background in security services. Training a professional security team has its own unique difficulties, which is why it’s best to leave it to those with experience doing so. Security companies have the expertise to know how to prepare their guards and manage them in a manner that results in professional responses to security incidents. Private security service companies also know what tools and resources security guards must have in order to properly perform their duties and will provide them for you. With an internal security team, not only do you have to pay our individual salaries, but as corporate employees, they also will require employee taxes, vacation time, benefits, overtime, holiday pay, and annual raises. With a private security company, you can receive the corporate security you need at a fixed hourly rate, which does not change until your contract changes. This is one of the most prominent reasons why San Antonio companies opt for our private security services rather than an internal security staff. Hiring a private security company simply makes your life easier as a business owner — saving you time, money, liability, and a multitude of potential hassles. There’s no reason to go through the trouble of building an internal security department and keeping them on the payroll when there are companies ready to provide you with everything you need and more to keep your company secure. If you’re ready to hire a security service to help ensure the safety of your business in San Antonio, contact Reveles Intelligence Group today.